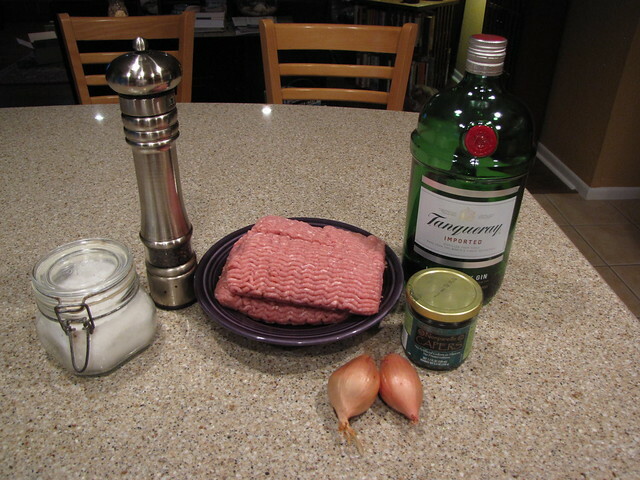 Burgers with Shallots & Gin…otherwise known in our family as Gin Burgers! This is one of those recipes where I’m sure you will think I’ve gone totally off the deep end. YES! Gin in a burger. Really! This is my dad’s recipe. He makes a mean martini – stirred, not shaken so it’s not surprise to me that he would have a recipe for burgers that incorporate gin. They also incorporate shallots and capers – lots of flavor. You might have to trust me on this one. But trust, you should. 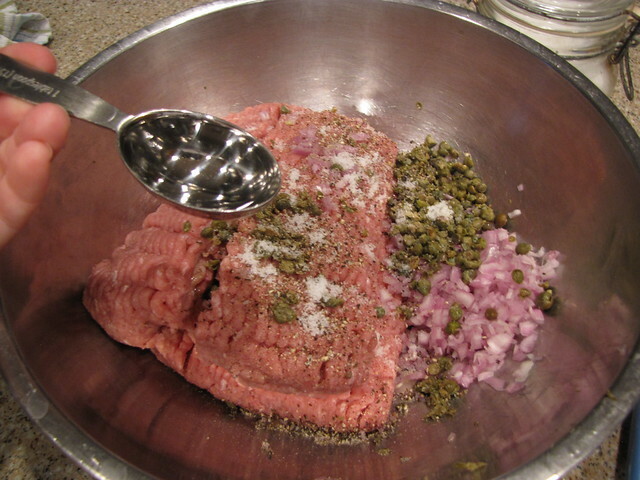 Ground Beef or Ground Turkey, Gin, Shallots, Capers, Salt & Pepper. 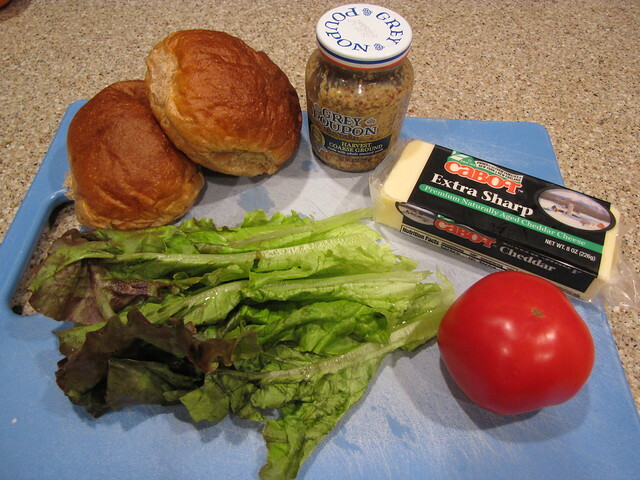 You will also need the good things that accompany burgers: Good Buns, Good Sharp Cheese, Good Mustard, Lettuce, and Tomato. Or whatever you like to have with your burgers. I avoided ketchup because I want the flavors of the gin, shallots, and capers to shine through. 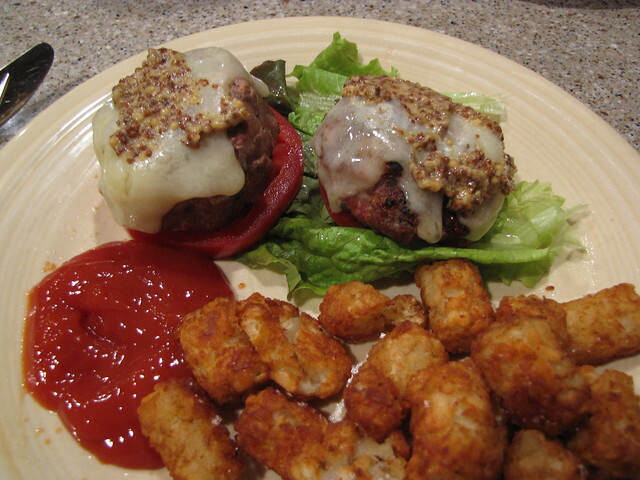 Plus, as you can see, I have tots that require ketchup. I require tots. 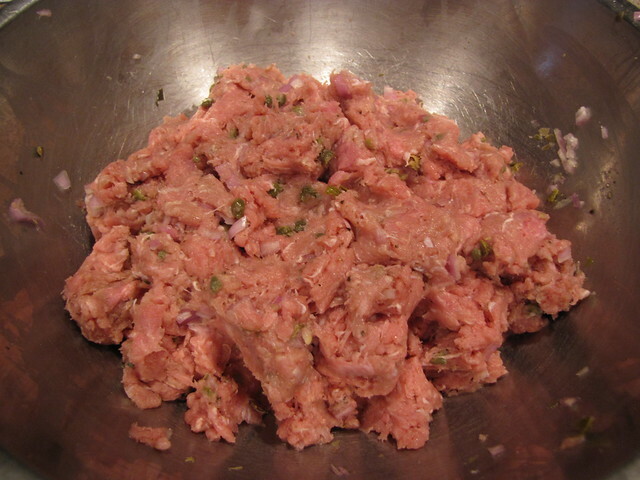 You can use either ground beef or ground turkey for this recipe. Turkey gives a lighter flavor but has to be cooked thoroughly. If you like your burgers more on the medium to medium rare side, beef is the way to go. 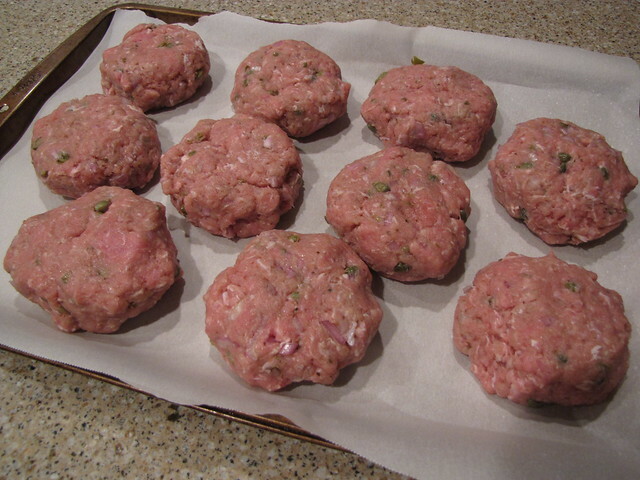 The recipe I’m showing here used 3 pounds of meat and made 10 smallish burgers. You can easily adapt this for any amount of meat. Burgers aren’t an exact science. 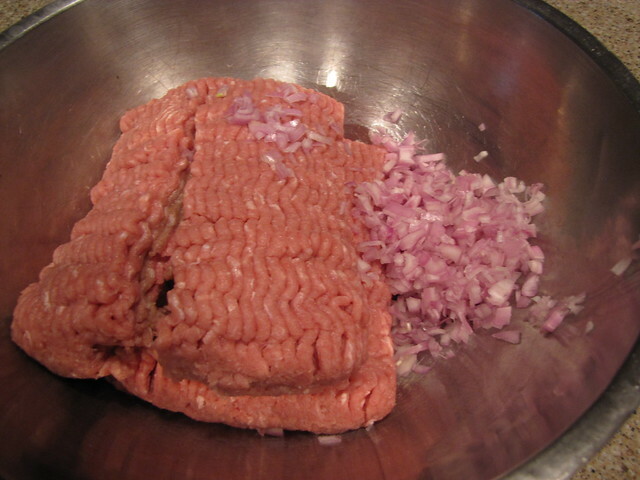 Add 2 finely chopped shallots to the bowl. Shallots are one of the milder flavored onions so they work very well here to give you a little bit of bite rather than a big overwhelming onion flavor. Drain and rinse 2 Tablespoons of capers. 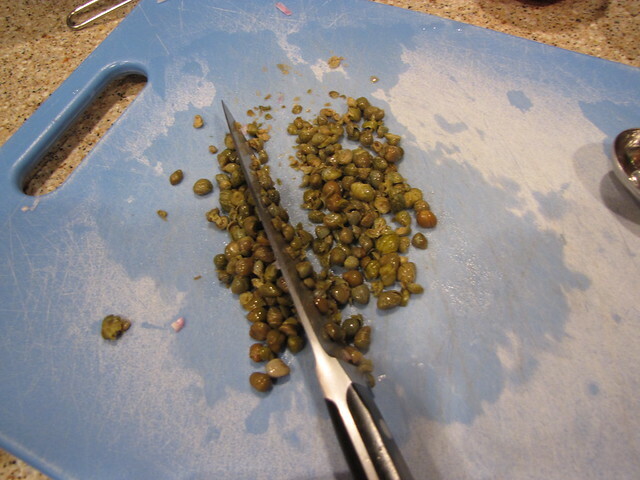 Even if the capers are small, I like to chop them slightly so you get a little bit of caper in every bite. Season with salt & pepper (about 1 teaspoon each) then add 2 Tablespoons of gin. The trick to juicy burgers is to not over-work your meat. Just gently combine the ingredients with your hands. Try not to get too aggressive. Just scoop out a little bit of meat (I even used my big sized ice cream scoop) and GENTLY form and pat it into a patty. I avoid rolling it into a ball and flattening it. You don’t need that much effort. Just get it into a patty shape as gently and quickly as possible. I like to place these on a piece of parchment so they don’t stick to the plate or tray. Also makes for easy clean up. You can cook these on the grill, under the broiler, or even in a pan on the stove. If you are grilling and if you are using turkey, be sure to OIL your grill thoroughly so these don’t stick. Another tip to good burgers is once they are on the grill DO NOT SQUISH THEM WITH YOUR SPATULA! Think about it, you are squishing out all the juice. No no. 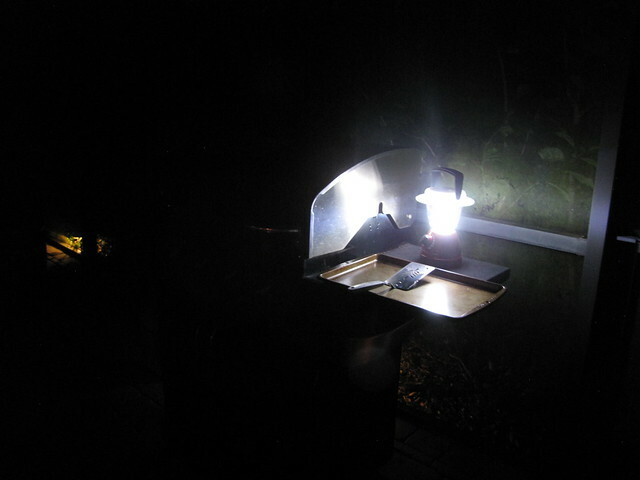 I’m grilling in the dark…sounds like a jazz song. 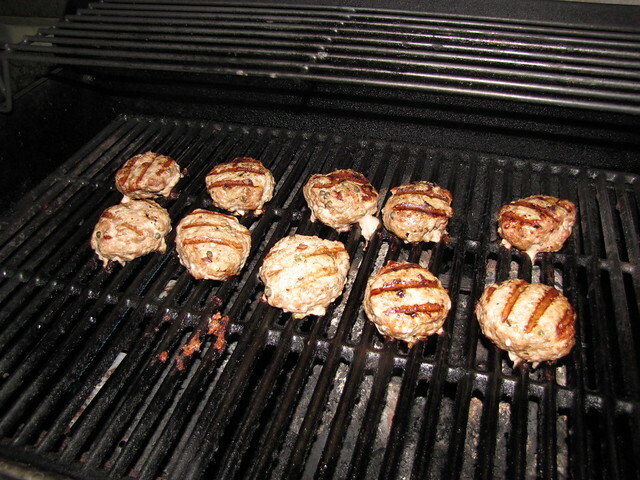 Turkey burgers need to cook at a moderate temperature until they reach 160 degrees on an instant read thermometer. If you’re making beef burgers, medium is about 140° and medium rare is about 130-135°. 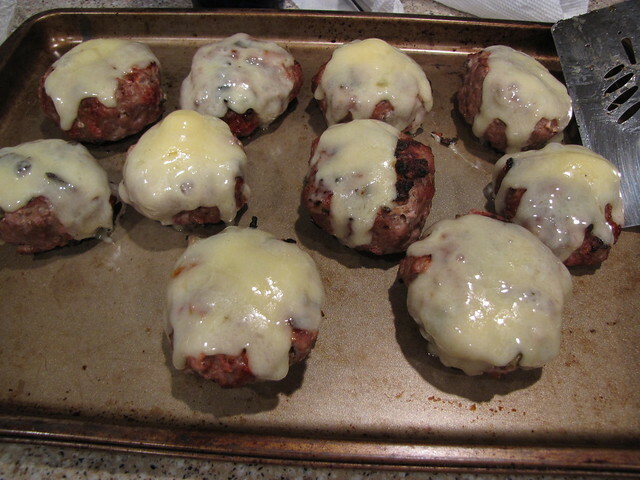 Before you take them off the grill, add the cheese so it gets all melty. You can also toast your buns. Then load them up with lettuce, ripe tomato, and grainy mustard. If you’re gluten free like me, you can skip the bun. But don’t skip the tots! Burgers with Shallots & Gin are juicy with a subtle flavor. If I didn’t tell you they had gin in them, you’d probably be wondering what made them taste so good. You get a nice salty bite from the capers and a little zip from the shallots. 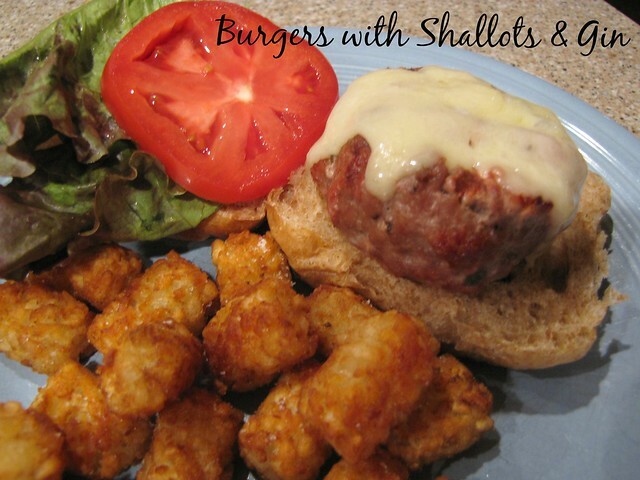 These are the perfect burgers to make for tailgating or for watching the Royals play in the World Series! Let’s Go Gin Burgers! Let’s Go Royals! clap, clap, clap clap clap. Oh dear, the gin’s all gone. Maybe it’s time for another bottle! It looks so good. Gin. In a burger? What the what? This is news to me!!! Looks delish to me. So….did you make the tots yourself too??? Heck no, I don’t make my own tots. Not that I wouldn’t consider it, but the good old Ore ida ones are fine with me. I did see a sweet potato tots recipe on Pinterest the other day though…hmmm…. Vodka in pasta sauce, so why not gin in a burger? I never thought of capers in a burger either. Good call. I think capers would be amazing in a salmon patty, right? Woo hoo! Ooh, I’m a huge fan of salmon patties so I’ll definitely try capers in them the next time. Good idea!